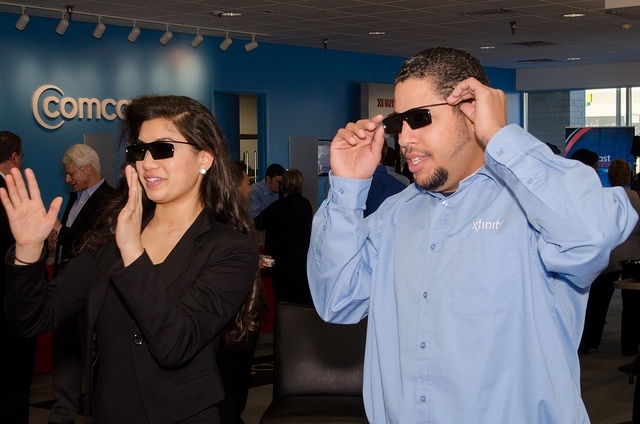 Miss Seattle, Jean-Sun Hannah Ahn, dons 3D glasses with Xfinity Store Supervisor Donald Palazzo at the Grand Opening of the Xfinity Store in Federal Way, Washington. Ahn was visiting because she is interning with KOAM TV, which covered the event. OK, so we’ve published a lot below about the new Xfinity Store in Federal Way, but we are proud of it. The store is one of the first half dozen of its kind in the country to banish lines and replace them with interactive displays and employees. One of the things you get to do at the store is watch 3D television, which is what Miss Seattle and our store manager are doing above. Probably the best pictures from the event show children having incredible fun with SpongeBob Squarepants; one mom told us her daughter had circled the event two weeks ago and had been counting down on a calendar. One highlight of the event for us was a donation of $2,500 to the Boys and Girls Clubs of Federal Way, to celebrate the opening of the store and our national partnerships with Boys and Girls Clubs around the country. But enough words already: check out the pictures from the Xfinity Store grand opening here on Flickr.